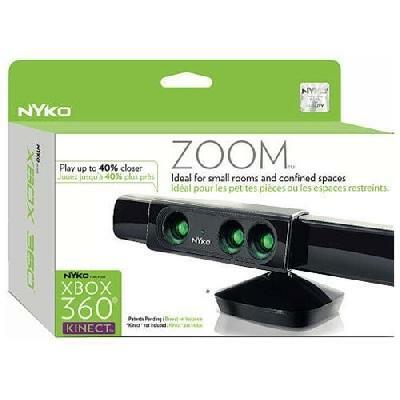 Zoom for Kinect - Xbox 360..
Nyko 86085 Nyko Zoom For Kinec..
Nyko Zoom Wide-Angle Kinect Le.. Product weight is 0.37 lbs. Decrease the space needed to play your favorite Kinect games with Nykos Zoom for Kinect. The Zoom reduces the play range required to enjoy Kinect software by up to 40%, allowing you to play closer to your TV. Zooms wide angle lens also enables two people to play in an area normally only suitable for a single player making it ideal for those in smaller apartments or dorm rooms. Specially designed optical lenses fit over the Kinect sensor and clip into place making set up a breeze with nothing to plug in. No additional software or calibration is required. The design of the Zoom blends seamlessly with the look and feel of the Kinect. The Zoom opens up a whole new world of Kinect play to those who previously lacked the space required to fully enjoy it.